Two were injured in this early morning accident. According to police reports, the accident occurred around 2:30 am today, Tuesday, January 24, 2017, along Parish Land Road, St. Philip. Involved was a Transport Board Bus driven by Elvis Clement 35 years of Silver Hill Drive Christ Church. Andrew Walker 47 years of Haggatt Hall, St. Michael, and Anderson Hall 47 years of Church Village, St. Philip, both employees of the Board, complained for pain to the feet and hand, respectively. They were both transported to the Queen Elizabeth Hospital (QEH) by ambulance for treatment. From photos it appears as though the bus ran off the road, went up a slight embankment and crashed into a Light and Power pole bringing down the power lines. The police are conducting investigations into the accident. 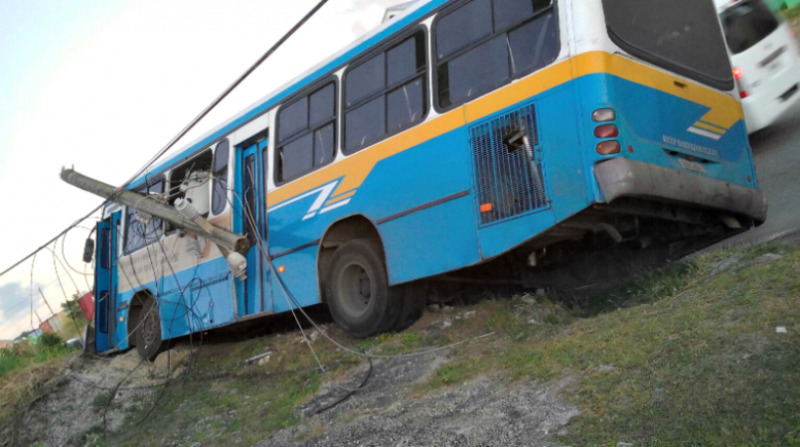 Transport Board’s Marketing and Corporate Communications Manager, Lynda Holder told Loop News that the injured persons were treated and discharged. She said that the Board is grateful that there was no damage to any passers-by, pedestrians or property. The staff bus was subsequently towed away. The next step she said, "we will now investigate to see what would have caused the incident to occur in the first place." Persons were wondering about the damage to the power lines and the impact of residents in the surrounding area. "There was no outage and a team is working to replace the damaged pole, but there has been no loss of service to our customers."